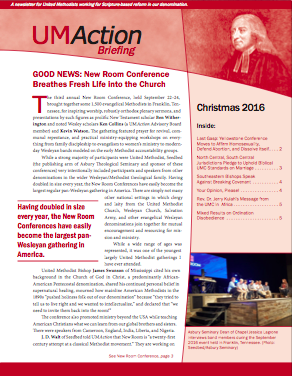 A newsletter for United Methodists working for Scripture-based reform in the denomination. This is a quarterly publication of UMAction that keeps church members informed about what is going on and offers advice on how people in the pews can become more engaged in the theological and political debates going on in the United Methodist Church. Download PDFs of past publications by clicking on the links below. Most recent briefing listed first. toward More Conservative Regions | Judicial Council Strengthens Biblical Standards for Who Can Be Clergy, Bishop | Your Opinion, Please!